Fall 2008 Issue of Sufi Illuminations Journal is dedicated to Professor Dr. Mohammad Masud Ahmad Naqshbandi (r.a). Prof. Dr. Muhammad Masud Ahmed (may Allah preserve his inner heart) was born in Delhi in 1930, and acquired his early education from his father, Mufti Muhammad Mazharullah (rahmatullah alayhi d. 1966), before attending Madrasa-yi Alia and then Oriental College, both located in Delhi. He migrated from India to Pakistan in 1948, where he continued his education at Punjab University ( Lahore) and at Sindh University, Hyderabad, Sindh. Graduating with honours for his M.A. and M.Ed. at Sindh University, Dr. Masud Ahmed finished a Ph.D. dissertation on "Quranic translations and exegesis in Urdu" in 1971, supervised by the renown scholar and sufi shaykh, Dr. Ghulam Mustafa Khan (rahmatullah alayhi). After this, Dr. Masud Ahmed continued researching the founder of the Barelvi school (Ahmad Rida Khan Barelwi, rahmatullah alayhi d. 1921), writing dozens of books and over one hundred articles on him after receiving his doctorate. He worked as lecturer, professor, and school principal, and examiner at Sindh University, Jamshoro; Khairpur University, Khairpur; and Punjab University, Lahore; as a paper setter for the Public Service Commission (Sindh); and as a supervisor of Ph.D. students at the University of Karachi and Khairpur University. He retired as Principal of the Government Degree College and Post-Graduate Studies Centre, Sukkur, Sindh, in 1992. Dr. Masud Ahmed was initiated into both the Naqshbandiyya as well as Qadriyya lineages. 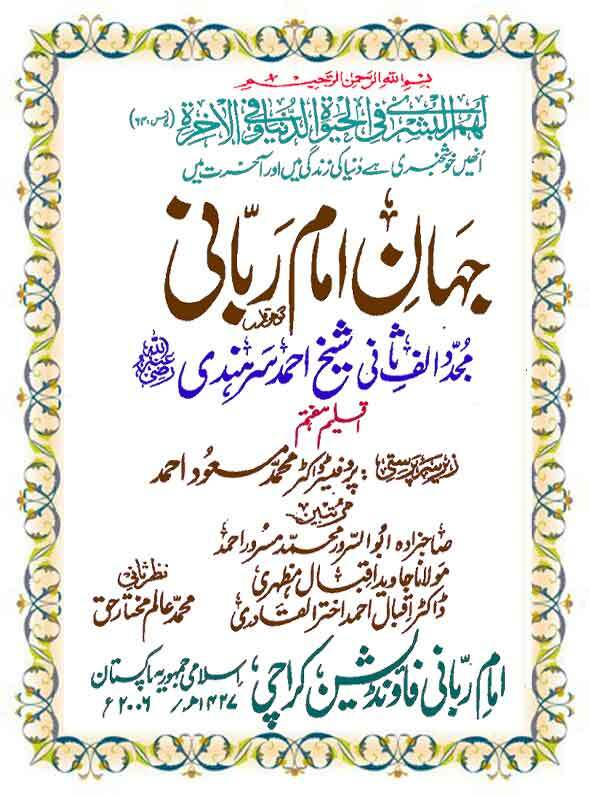 His father, Mufti Shah Muhammad Mazharullah and Mufti Muhammad Mahmud Alwari (rahmatullah alayhi) from Hyderabad, Sindh are his two principal Naqshbandi shaykhs, while Zaynul�abidin Shah Qadiri (rahmatullah alayhi) from Nurai Sharif, Sindh and Mufti Shah Muhammad Mazharullah (rahmatullah alayhi) were his principal Qadiri shaykhs. 1) To publish research articles on Shaykh Ahmad Sirhindi (rahmatullah alayhi) who died in 1624 in Sirhind, India and is commonly known as the renewer of the second Islamic millennium, "Mujaddid Alf-i Thani." 2) To translate literature about Shaykh Ahmad Sirhindi into Urdu from other languages. 3) To publish an encyclopaedia encompassing the biographies and teachings of the Naqshbandi-Mujaddidi lineages. 4) To hold an annual Imam-i Rabbani Conference and publish a journal Yadgar-i Majaddid. 5) To have communication with scholars studying the Naqshbandiyya- Mujaddidiyya on an international level. At the time of Dr. Masud Ahmed's passing, the goals of the Imam-i Rabbani Foundation had manifested. His Jahan-i Imam-i Rabbani Mujaddid-i Alf-i Thani in eleven volumes had already been printed. The lifelong effort that Dr. Masud Ahmed has put into communicating the life and teachings of Shaykh Ahmad Sirhindi is exemplified by this mammoth and unparalleled collection of scholarly materials. All of the above indicates the tangible, worldly form of Dr. Masud Ahmed's magnificent contribution to Islamic education and research. It fails, however, to convey the more subtle formless qualities and aspects of his life and teachings. I had the honour of meeting Dr. Masud Ahmed eight years ago in Karachi. His calm, radiant being has left me with the lasting impression of a truly great man. The only way I can put it into words is to say that Dr. Masud Ahmed's being emanates the fragrance of the inner sunna of the Prophet Muhammad (may peace and blessings be upon him). If he had not published a word and if he had been totally unknown to the outside world, it would not have diminished his inner realisation at all. It is that realisation that can we can take with us when we return - as we all inevitably will - to our Lord.